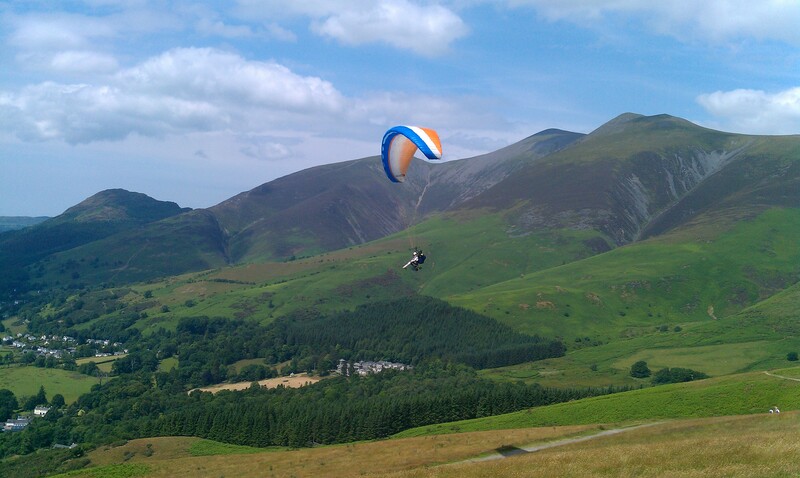 In July 2013 Steve Kitchen arranged a series of tandem paraglider flights for people with MS. They flew with help from Gordie at Air Ventures. The following is from a write up for the South Lakes Branch MS Newsletter. Wednesday the 17th July will be a day we will never forget as that was the day we were given the opportunity to go parascending at Latrigg Fell, Keswick. Many thanks to the MS Society, to Steve Kitchen who organised the day, the paragliding school Air Ventures and the charity Flyability who helps fund such events. 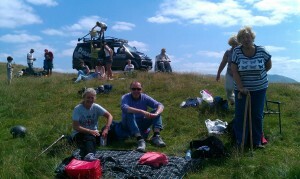 It was a clear, warm and sunny day as we, 5 people with MS and 3 Carers were driven to the top of Latrigg Fell in a 4X4. The Air Ventures staff were patient and fully explained the procedures and we were each launched in a sitting or prone position strapped into a harness in tandem with an instructor. The time in the air varied from person to person dependant on the wind and thermal conditions. Peter flight lasted approx. 20 mins and Anne’s 40. The experience -was exhilarating and liberating and the views of Keswick, some 1300 feet below and the surrounding hills were spectacular. With the assistance from Air Ventures staff we all landed safely with tales to tell our family and friends. Our party had a fabulous time and we would recommend the experience to anyone regardless of their abilities. The morning of the tandem paragliding flight, weather conditions were perfect as was the rest of the day. Volunteers soon turned any anxiety into excitement. Magnificent views were appreciated as we soared through the sky. A day that we will never forget. Paragliding begins to sound rather pleasant! He notes my contact details and I say “Well I’m NOT going”. Me 2 I’m frightened about everything! 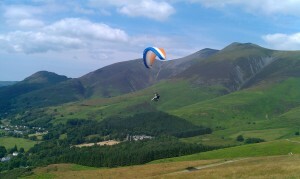 Just a week later I’m on Latrigg, Keswick. I am so excited, so very, very excited. Before I know it, after sitting, burning in the sun, with no way of standing up and no loo within miles (it’s strange how you can improvise when you’re with a crowd of friends!) it’s my turn to go up and I’m ready. The guys who organize the day are fantastic. They help me across the rough grass and sit me in a ‘baby bouncer’ sort of contraption. They secure me and put my helmet on. Behind me is strapped one of the guys attached to the ‘wing’, so we’re in tandem. Then they run forward with us until we begin to rise up. They let go and we’re airborne! Higher than I’ve ever been before (and aeroplanes don’t count!). It is absolutely amazing! The biggest disappointment for me is that the thermals don’t oblige and, within 8 minutes I’m back to earth. I get motion sickness as we land (Note to self– Get some decent car sickness tablets and maybe those wristbands?!!). But it is all worth it: those 8 minutes have changed my life. It’s the freedom of a bird, untethered, going where you want, calm, peaceful, and I’m hooked. I’m booking to go up again. I love it and I want more of it. All my friends can’t believe I would go and do such a crazy thing! They all walk for miles and miles and I can’t do that anymore. But, something so much better: I CAN FLY!